Contents: Text and multiple-choice test online. 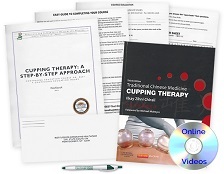 Do you have the Traditional Chinese Medicine: Cupping Therapy textbook? See your enrollment options above for "I already own the text". As a massage therapist you are constantly looking for new techniques to add to your practice in order for you to keep improving and widening your skill set and to provide more choices for relief, relaxation, and healing to your clients. One technique, cupping therapy, has recently become a topic of discussion. Many massage professionals are finding clients now asking about cupping massage. Whether the client is simply curious about what cupping entails, its benefits, or whether it would be an appropriate treatment for them, you should want to be able to answer your client's questions with confidence and certainly provide the treatment, too! Cupping Therapy: A Step-by-Step Approach examines over 30 different disorders and common sports injuries from a Traditional Chinese Medicine (TCM) perspective and discusses the role of cupping in assisting each condition. 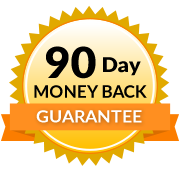 Our course offers you a look at the historical use of TCM cupping in folk medicine, a review of TCM theoretical principles and gives you step-by-step guidelines for the twelve methods of TCM cupping therapy utilized in Traditional Chinese Medicine today. Safety precautions, contraindications, and the use of cupping for treating trigger points are also discussed. You will explore the role of cupping in a variety of clinical contexts – ranging from the treatment of children to the effective management of sports injuries and myofascial pain. Our well-established, highly successful course text provides you with a a useful step-by-step approach to the effective application of traditional cupping techniques with special emphasis on issues of safety, expectation and theoretical principles of action. To further support your learning, online 'how to' videos and downloadable images are also available to complement the course text. Thank you again for a great course. I took an in class, hands-on 8-hour class and I learned more in this class than I did in the one I attended! Highly recommend! I personally prefer to learn techniques from the source staying true to the original practice. Your course has given me a great foundation from the ground up. Understanding the history of the practice is very helpful. 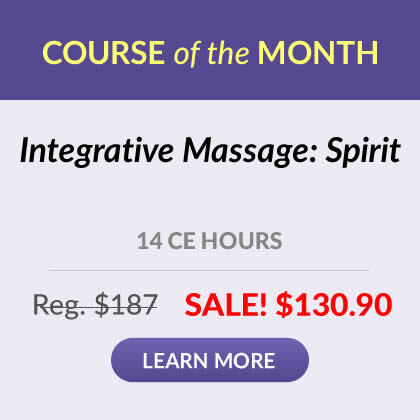 The course covered all of the techniques and therefore makes it easy to determine which technique would be the best for an individual practitioner without treating beyond the â€œScope of Practice.â€ Thank you so much...This has been very enjoyable. The problem with the text Traditional Chinese Medicine Cupping Therapy had a lot on Wet Cuppy which was interesting, but massage therapist are unable to use this style of cupping. This was a great starting point to learn about cupping and implement into my own practice. The course was very interesting, it actually exceeded my expectations. I look forward to taking my next class! Material very informational and with research resources. Summarize the history of cupping therapy and its use in folk and indigenous medicine throughout history and review the types of cups available. Review the basic concepts of Buddhist medicine and how cupping is used in this system in this tradition. Identify the benefits of cupping to the lymphatic system, skin, and nervous system and for treating stagnation of Qi. Review how to prepare a client for treatment and utilize the four-zone cupping treatment system. Observe cupping therapy using correct procedures for the specific type of cupping chosen. Explain precautions and contraindications as well as general safety considerations for cupping therapy. Differentiate between the twelve different methods of cupping therapy and explain each technique. Recognize specific populations and techniques that require special consideration and precautions and explain how they can be safely treated. Discuss scope of practice as it relates to the use of each method of cupping therapy and the use of cupping therapy for various conditions. Review cupping use for specific complaints, conditions and disorders, including sports injuries. Discover how to integrate cupping therapy and myofascial trigger point treatments to use cupping on trigger point sites. Review evidence based research on cupping therapy.